Prior to the 2016 spring season MPTLL was approached by Blaine Sanders, a Partner at Robinson Bradshaw who was acting on behalf of the firm’s Board of Directors in hopes of establishing the Coach Robert G. Griffin Scholarship Fund. Mr. Sanders was aware of MPTLL's long history of never turning away a child for financial reasons. In fact, each year MPTLL grants between 125-150 full and partial scholarships for children playing T-ball, softball and baseball. Regardless of the circumstances related to why assistance is needed, the MPTLL scholarship program is setup to make sure all players have the opportunity to play. During Opening Ceremonies on Saturday, April 9, 2016, Mr. Sanders was joined by current TRL players and former CP players to honor Robert Griffin for his years of commitment to the children of MPTLL and specifically the Grier Heights community. 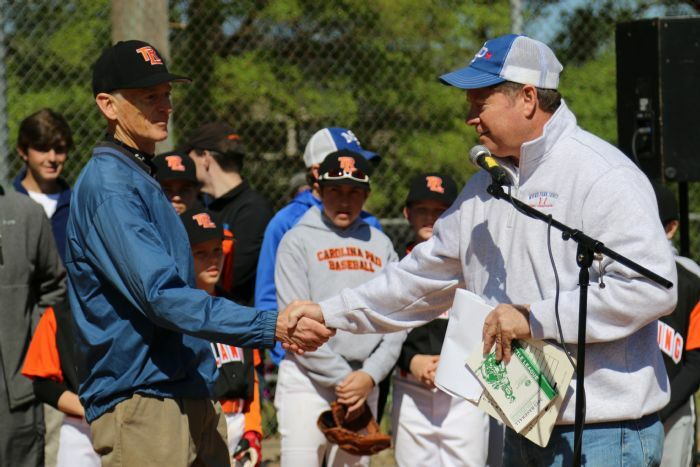 For newcomers to MPTLL, Coach Robert Griffin is an inaugural member of the MPTLL volunteer Hall of Fame. At the time of publishing, Robert continued serving as a major league head coach for TRL, as a Board member, and also as an Executive Committee member. In addition, Robert still practices law as an attorney with Robinson Bradshaw in Charlotte but he recently stepped down from his position of Managing Partner, a post he held from 1996 until late 2015. In honor of Robert's commitment to serve others Robinson Bradshaw wanted to establish the Coach Robert G. Griffin Scholarship Fund to make sure all children regardless of their situation has the opportunity to play baseball and softball at MPTLL for many years to come. Therefore the Firm and the partners donated $20,000 in Robert's name to establish this wonderful scholarship fund for future players and families. Many thanks to Robert Griffin for all he does for MPTLL and to Robinson Bradshaw and the partners for their generous donation. If you or your company would like to participate or make a donation to the Robert G. Griffin Scholarship Fund then please click the donate button below to begin the process. As a reminder, MPTLL is a non-profit organization and will be glad to provide the necessary documentation to insure your donation is tax-exempt. In addition if you are parent and need to request scholarship assistance then click the request button below and complete the form.